This course gives students the skills, strategies, practice and confidence they need to increase their scores on all sections of the toefl test, including the test of written english. 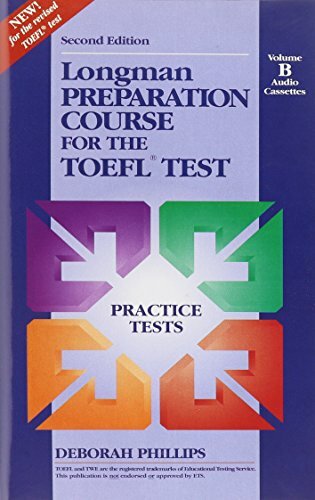 This edition reflects the revised toefl, first administered in july 1995, and skill coverage has been expanded for all sections. Volume a explains and practices key language points so that students improve their language proficiency as well as their test-taking skills. Clearly defined steps, pre- and post-tests and toefl exercises guide students in improving toefl strategies and scores. Toefl answer sheets are included, along with scoring information. The two cassettes contain a wide range of listening material. Volume b contains five complete practice tests; a comprehensive "strategies" section to help students avoid common mistakes and maximize their time; and horizontal and vertical answer sheets to familiarize students with both common formats. The teacher's manual provides explanatory notes and teaching ideas, as well as tapescripts and full answer key.